The industrial look boasts a utilitarian style, with design features that offer a minimalist appeal and are highly functional. Whether you have an apartment, a suburban house or a countryside cottage, any home owner can incorporate the industrial style with these few simple tips! When you think about industrial chic, your immediate attention is drawn to the openness, the vintage, stand out pieces and the metal elements embellished throughout the space. Designing your interior and decorative features around your industrial style hardware will pave a pathway to completing the look! Minimalism and simplicity are a key aspect of this style and usually incorporates aged brick or concrete walls in a space of raw architecture. This distinct feature focusses on the way that space is utilised and how it appears to always look incomplete. Renovated factory lofts are fantastic spaces to incorporate the industrial style as they render large open spaces, open floor plans and high ceilings. However, there are ways to obtain this stylish trend without selling up and relocating! Our philosophy is ‘keep it simple’. Incorporate industrial style metal hardware into the structure of your home, matching the finish of the door handles with your hinges and locks. Choose textured knurled handles in either a matte black, stainless steel or copper finish to add style and layers of depth to the interior. The contrasting smooth composition of satin stainless steel over the rose and stem of the lever with create a charismatic visual texture whilst feeling robust in the hand. After choosing your dominant metal finish, install internal door hinges in the same hue to complement the striking appearance of the handles. Forget carpets, install real wood or laminate flooring in either vintage or light oak to obtain an authentic factory look. Stainless steel hardware will look exceptionally prominent when paired with cool toned grey light oak flooring and concrete walls whereas copper hardware will suit warm toned vintage oak flooring and brick walls. 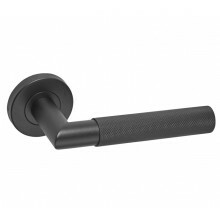 Matte black hardware presents a neutral hue and will suit either cool, warm or neutral interior decor. Use your space wisely and make sure not to overcrowd your furnishings and possessions. Leave pipes and wires exposed to get that working ‘factory’ look and focus on incorporating furnishings that adhere to the metal elements to highlight the rawness of the interior. Proudly display metal furnishings such as a metal coffee table, a traditional oak table in the appropriate tone, and industrial 20th century lamps. Further accessorise by adorning your space with metal framed mirrors, clocks and lighting fixtures to complement your hardware and colouring. 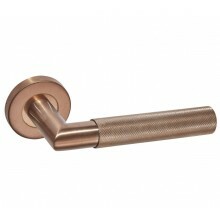 Conforming to your chosen metal finish, fix knurled textured hardware to your storage units to add stylish detailing. Don’t forget your stand out pieces! This may include a few salvaged and vintage articles as the industrial style permits the inclusion of upcycled and aged items. For a unique aesthetic, try cutting up old credit cards into guitar picks then feature them next to a hanging or standing electric guitar. This crafty project will produce a quirky ambience to the space and will have your guests gazing in admiration. Remember to keep your home open and airy as overcrowding a room can distort the desired effect that an industrial style delivers. We understand that your environment can greatly affect your mood whilst showcasing your own character and style. To help simplify your decisions, we offer a variety of high-quality products that excel in both aesthetic and performance, suitable for both contemporary and more traditional homes. 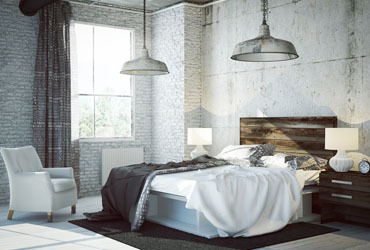 Check out our offering to obtain your very own industrial style interior.